This notebook (and supplementary references) can be found on my blog: http://koaning.github.io "
Documentation is done via markdown in the actual notebook file. 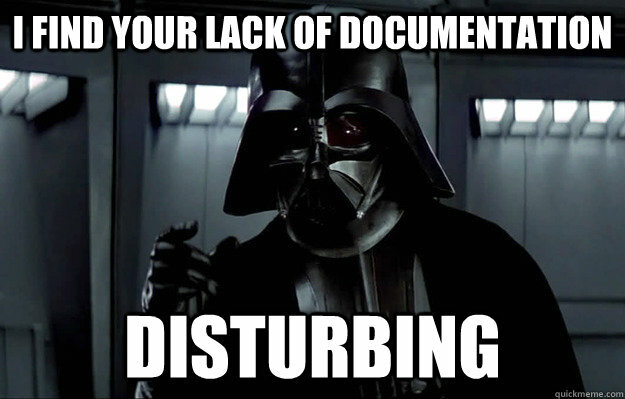 Tends to read better than comments in sublime and it makes it extremely easy to share with collegues. Notice that it also has support for formulas and other languages. By the way, did you know about this trick? You can install things via pip FROM the ipython notebook if you really wanted to. Pandas gives you a datastructure called a DataFrame. This is the object that contains the data and methods that you'll use the most. Initially, the DataFrame will look like a dictionary that contains arrays with extra functionality but in real life it is an high performant data wrangler that provides a more flexible API than excel. Let's go and create a simple DataFrame. Note that difference between a and pd.Series(a). Pandas translates arrays into a pd.Series object. These objects have characteristics that you would expect from an array but it allows for a flexible index. Normal arrays only have numerical indices but this object also allows for dates and strings. This also means that you can use said indices for more flexible selections of data. 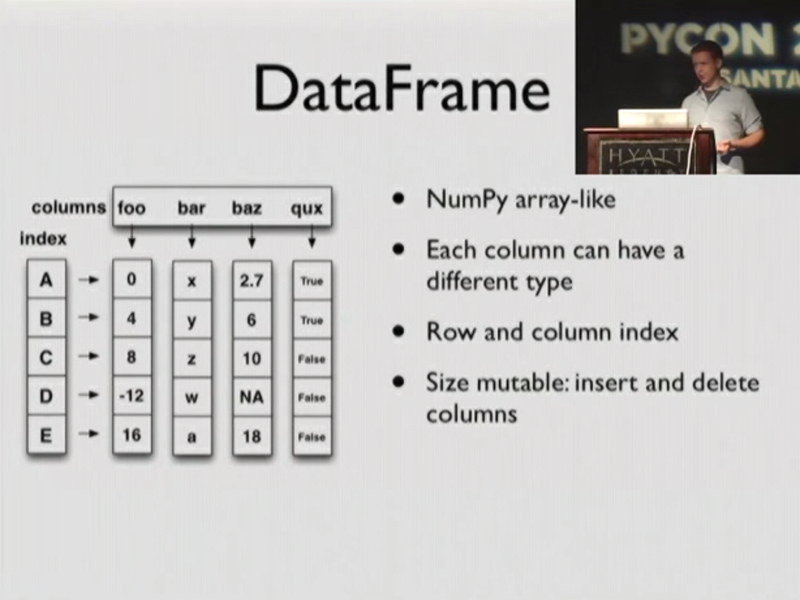 Also note that pandas lists the dtype of the array, a normal python array will not do this. 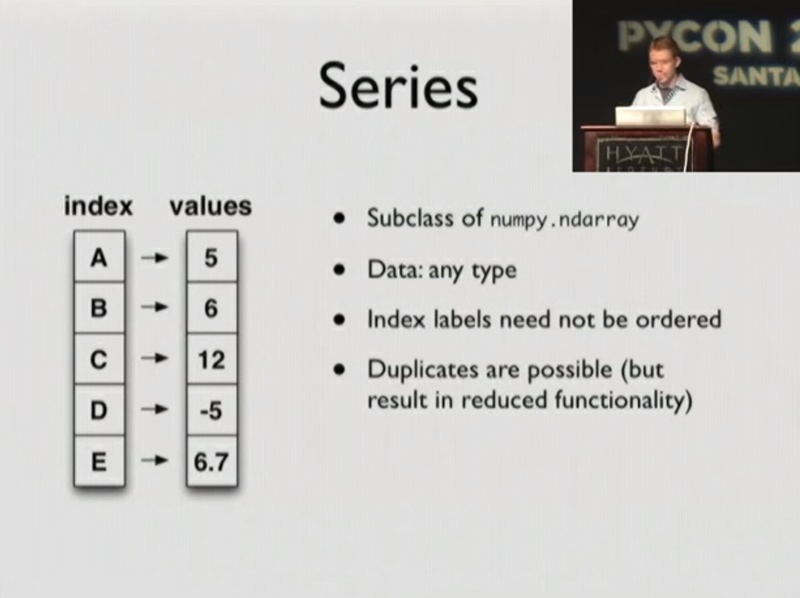 Pandas keeps track of what datatype is in the array, again to help you make selections. 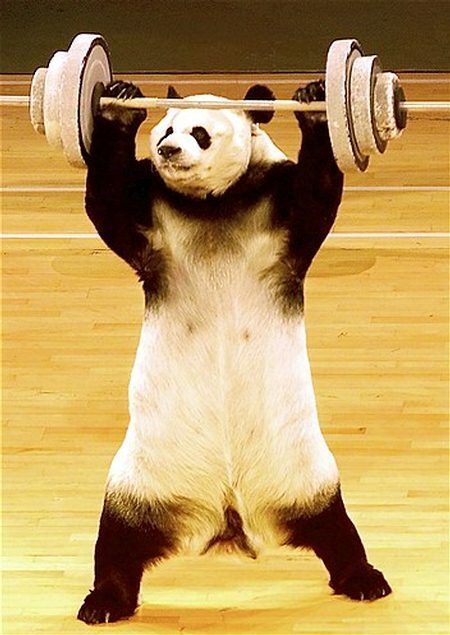 If the types aren't clear to pandas it will refer to it as an object array. Let's now use this dictionary to create a DataFrame object. This DataFrame object will be the main object you will talk to when using pandas. Note the column names are just like those assigned in the dictionary. Also note that the indices of this data frame at the same indices as the original pd.Series objects. This object should feel like the traditional excel table. List of simple queries we can ask to this object. Notice for this last query that we don't just get array values back. We also get the original indices from the dataframe. Note the indices for these two methods. 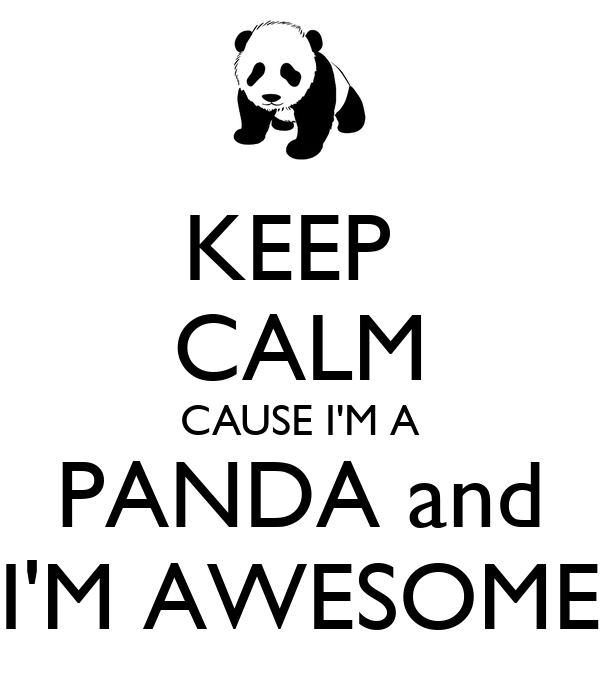 Pandas was written by Wes McKinney, who wrote it while working at a financial institution. Financial data analysis usually involves working a lot with dates. It is no coincidence that pandas has great support for working with time series. We can easily apply functions per week or per month. The timeseries support is vast. 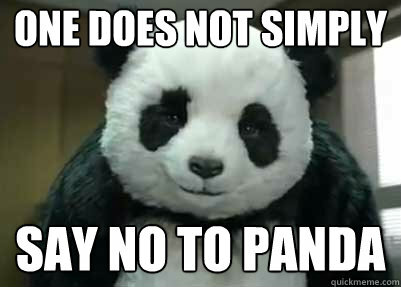 Pandas only requires that the index of a dataframe is a timestamp. It then allows you to perform any function on any grouped part of data. So the index that is supplied doesn't have to be a number, it can also be a timestamp! Pandas has great support for these kinds of operations. Based on the key of a dataframe we will split the data and then apply functions to the grouped data. For this next bit we will use the chickweight dataset. 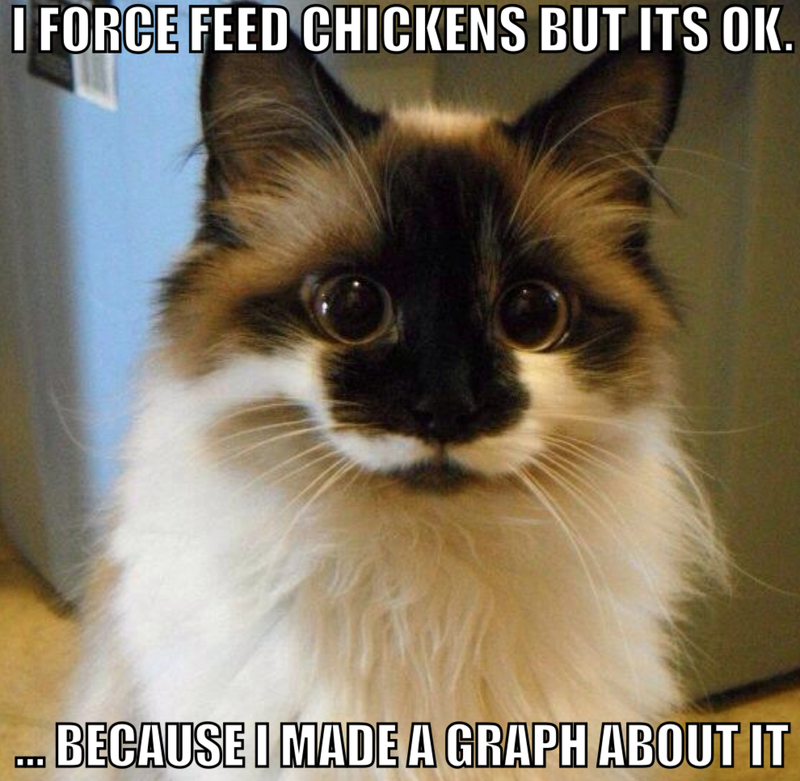 This dataset contains information about different diets for chickens. The goal of the dataset is to find out which diet will get the chickens as fat as possible. 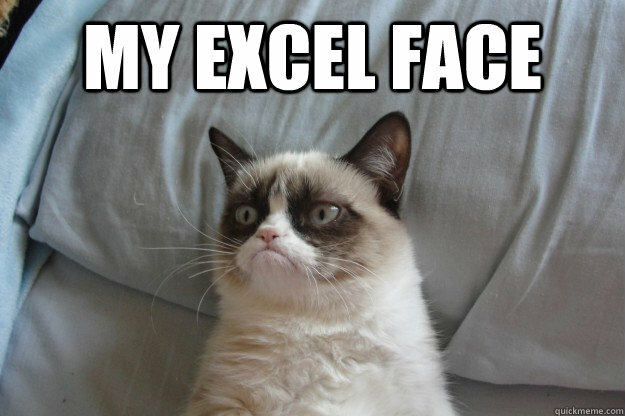 Imagine doing just that operation in excel. The goal is to find out which diet causes the most weight gain for chickens, so let's group chickens per diet. You do this by creating a grouped object. This groups the dataframe to groups based on column values. This grouped variable can be iterated over. Each group still behaves like a dataframe, so we can also apply the describe function here. We can use built in functions on our grouped objects, but we can also just apply our own functions. Note that these functions need to be able to be applied to a DataFrame object. return "Dude we have " + str(len(x)) + " chickens here!" 1       Dude we have 220 chickens here! 2       Dude we have 120 chickens here! 3       Dude we have 120 chickens here! 4       Dude we have 118 chickens here! Realize that this means that any function can be used here. You will want to think about performance when dealing with large datasets. This functionality is one of the things that make the pandas API very powerful. We can also created groups based on two columns in the table. 1     0       Dude we have 20 chickens here! 2       Dude we have 20 chickens here! 4       Dude we have 19 chickens here! 6       Dude we have 19 chickens here! 8       Dude we have 19 chickens here! 10      Dude we have 19 chickens here! 12      Dude we have 19 chickens here! 14      Dude we have 18 chickens here! 16      Dude we have 17 chickens here! 18      Dude we have 17 chickens here! 20      Dude we have 17 chickens here! 21      Dude we have 16 chickens here! 2     0       Dude we have 10 chickens here! 2       Dude we have 10 chickens here! 4       Dude we have 10 chickens here! 6       Dude we have 10 chickens here! 8       Dude we have 10 chickens here! 10      Dude we have 10 chickens here! 12      Dude we have 10 chickens here! 14      Dude we have 10 chickens here! 16      Dude we have 10 chickens here! 18      Dude we have 10 chickens here! 20      Dude we have 10 chickens here! 21      Dude we have 10 chickens here! 3     0       Dude we have 10 chickens here! 4     0       Dude we have 10 chickens here! 20       Dude we have 9 chickens here! 21       Dude we have 9 chickens here! You can also combine pandas with plotting tools like ggplot for fast interactive data exploration. But in all seriousness, you might want to start thinking about the ethics used in data.